Don’t you just love hearing new words, like this one, yum woon sen? I do, and what I love even more is trying new things and making them later on, because there are those days where you might crave these types of flavors. 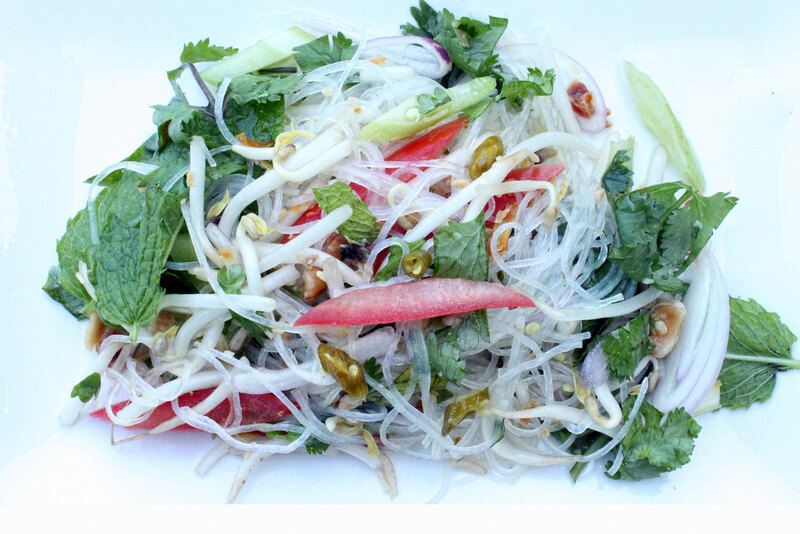 Yum Woon Sen is nothing short of flavor. It’s essentially a bean thread salad loaded with fresh herbs, vegetables, and roasted peanuts. You can go the route and add things like minced pork or shrimp, but to me I think leaving those out are just perfectly fine. If you are looking for a light salad that is packed with great flavors, and one that is a great side dish on a hot summer day, then give this one a shot. Start by making your dressing for the salad. To a small bowl, add the juice of the two limes. Add in the fish sauce, and sugar. Stir until the sugar dissolves. Next, soak the noodles in warm water for about 10 minutes. These things can be a bit tricky so keep an eye on them. You still want them firm at this stage. After 10 minutes, strain the water, then add in the hot water. Stir the noodles, and let them cook for about 2-3 minutes, just until they soften, but not mushy. You don’t want mushy noodles. TRUST ME. Once the noodles are softened, strain them and run cold water over of them. Strain again, gently squeezing any excess water from them, and place them into a large serving bowl. Now let’s make the salad. Add in the remaining ingredients, with the exception of the dressing, and toss and turn to make sure everything is incorporated. Now, pour in the dressing, and continue to lightly toss until everything looks great.